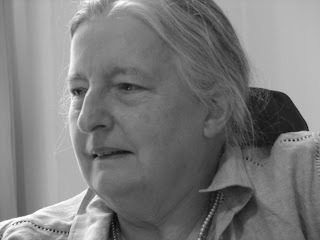 My mum, taken by my sister, Stella Bell. 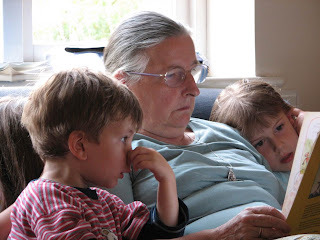 Shortly after posting my last blog (and two days after we’d been chatting about it), my mum, Margaret Bell/Storr died very suddenly and completely unexpectedly. She was well and happy, but she’d broken her ankle five weeks before, and, unbeknownst to us all, she’d developed a blood clot which went very quickly to her lungs. 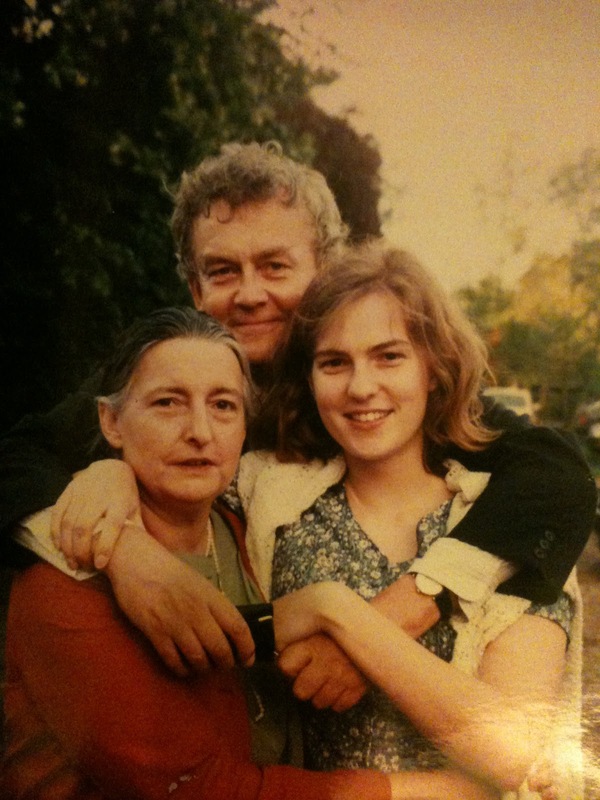 She’d spent part of the morning with my dad and brother and part writing more of her work in progress, a middle grade novel about a girl in the Second World War –a version of which she’d emailed to me less than 24 hours before she died. She had been on a creative roll. She’d always been creative. 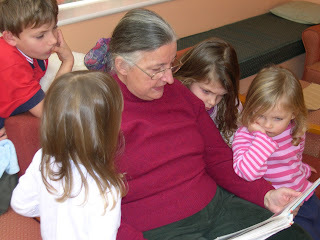 She drew, painted and wrote –stories for her students, to fit their level of English but also their level of interest and understanding; beautiful, often rhyming, notes to us when we were children; stories for her grandchildren, and for the past five years or so, she had been a fellow member of the SCBWI (Society of Children’s Book Writers and Illustrators). 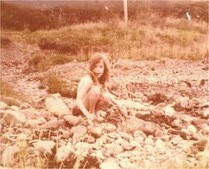 She was also writing short stories for adults and lots of poetry, both of which had had recent success. As someone who relied on her sharp mind for writing, painting, reading and conversing, getting dementia (like her own mother) was her greatest fear. It is a real comfort that this never happened. As for breaking her ankle? Well, she couldn’t do the thing she hated –housework, but she could absolutely do the things she loved, whilst being looked after by family and friends: write, read, paint and spend time with people she loved. She sounded happier in the last five weeks than I can remember –ever. More a Clare than a Juliet? and only my brilliantly bonkers Shakespearean-loving parents could have made the decision to name my eldest brother Andrew Michael Bell even though they were always going to use Michael because ‘if his initials had been MAB [rather than AMB], people would have teased him’ (because of the tiny midwife fairy, Queen Mab, spoken of by Mercutio, also in Romeo and Juliet...?!). Stories were central to their lives and ours. My mum never shied away from telling us sad stories. I particularly remember Orpheus and Eurydice, which I agonised over as a child, and also the story of Lot’s wife being turned into a pillar of salt, which I turned into a slightly odd, superstitious game on my way to school. And the songs they sung to us at night! ‘I heard the curlew crying far, but I never heard my baby-o...,’ or ‘Ah my Geordie will be hanged in the golden chains, 'tis not the chains of many...’ (and many other Joan Baez songs). The songs and the stories and the storytelling were beautiful. The language of sad is often extremely beautiful. And they instilled a love of language in us. For the Christmas before I turned six, they gave me The Green Children, written by Kevin Crossley-Holland and illustrated by Margaret Gordon, a really old East Anglian story. But they didn’t just give me the book. 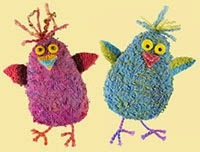 My mum sewed me Green Boy and Green Girl, which I still have now. And the dolls’ faces reflect the sad story. I cuddled them pretty much every night throughout my childhood as if I could somehow change the story and save Green Boy–which I did, for the doll at least. Green Girl and Green Boy are still alive and well thirty six years later (even if Green Boy’s tunic has recently been removed by a small child...). And of course it wasn’t just sad stories and songs–there were also a lot of funny and silly ones –and run-of-the-mill every day ones. But it’s the sad and the funny/silly ones that I’ve remembered the best over time. But there’s something much bigger that my mum and dad gave me, the most important thing that any parent can give a child: unconditional love. 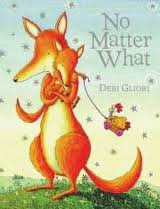 If you haven’t read Debi Gliori’s wonderful picture book, No Matter What, then you’re in for a treat when you do. sends aching pains all through my breast"
This is how my mum and dad described the feeling of overwhelming love for your children when you creep into the bedroom at night and watch them sleeping. It's so true. I’ve not written or edited a single word of a story since March 12th. I have no appetite for it at all. It seems to belong to another time entirely. But I know that I’ll probably feel like it again at some stage. In the same way that I couldn’t read more than a couple of sentences for a whole year after I was attacked (I simply couldn’t remember the start of the sentence, let alone, the paragraph), and then I went back and finished the PhD I was writing, I am likely to find head space to write stories at some stage. Even writing this blog post has made it seem closer. I’ll be up in Orkney when this post comes up –with my dad and in the place my mum loved so much. We’ll sort out some paper work, work on setting up a project in my mum’s name, talk, cry, laugh, walk around some of her favourite places, and most of all, love –and be loved. The writing? As Abie showed in her recent blog post, that can wait. 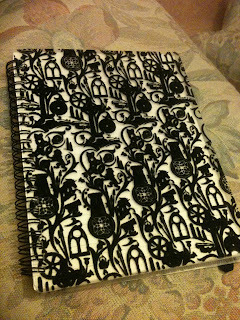 My mum's recently started notebook, which I'm now using as my own. Thank you, Wendy, for your lovely reply. And the best thing I can ever do is to make my children feel as loved and secure as I always have been. Sad times but there are lots of happy memories. If you haven't read Debi's No Matter What, I'd urge you to read it. Thanks again, Clare. Wow. What beautiful, powerful words. They touched my heart. I'm so sorry for your loss. You are so fortunate to have such wonderful, loving memories. My best to you. Thank you Jill. I really appreciate your comment. All the best, Clare. My heart goes out to you in your loss, Clare --- what a wonderful tribute to your Mum. She will be within you forever, even in those aching moments when you so long to share something with her. Be gentle with yourself, sing when you can, write when you can. Thank you, Beth. It's true. 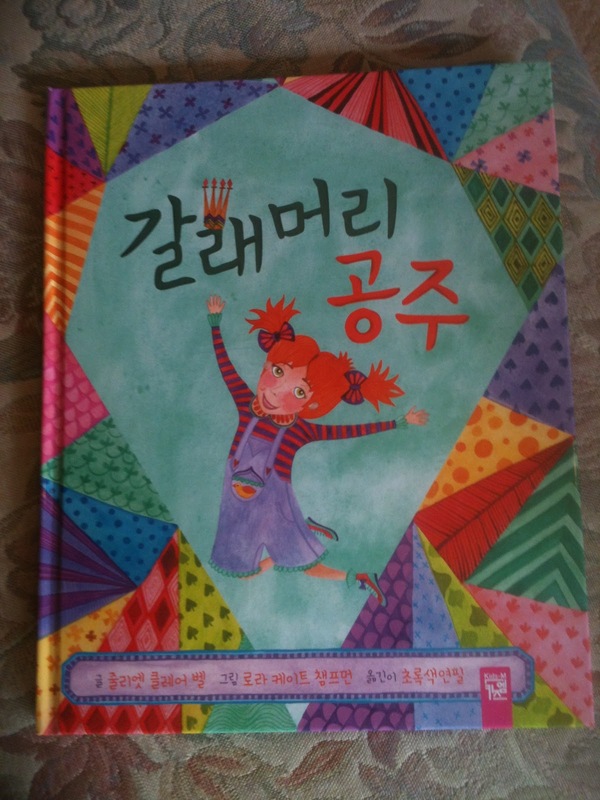 And if you can get hold of a NON American version of No Matter What, I'd really recommend reading it. It captures that so well. (But not the UK board book, which is the same as the US edition...). Thanks again, Clare. Thank you, Sue. I really like the idea of writing to your mum every day. I hope it helped. I might try it myself... Thanks, Clare. It did, Clare - there was always something I wanted to tell her. Now I no longer write to her, I feel that she's always with me. How good that your mom was so happy in those last few weeks, and that you still and always will feel her unconditional love. Thank you for your beautiful words that brought a tear to my eye, and memories of my own mother who crossed over years ago. Thank you. Here's to fond memories of our mothers. Clare. What a lovely tribute to your dear mother. It reminded me so much of my own. She too, was a grand and loving soul. Thank you for sharing. Thank you, Bobbie. Glad your mum was a grand and loving soul! All the best, Clare. Thank you, Clare, for sharing a bit of your wonderful mother with us, for reminding us of the beauty in the 'aching pains', and for inspiring us to love more. I'll be looking for that book, and can picture myself hugging it already. Thank you, Julie. 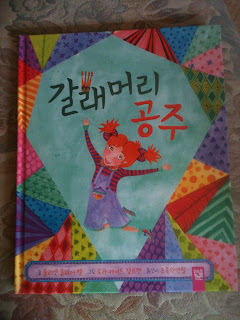 It's such a great book. Someone else just contacted me to say she bought it when her mum died years ago for her and her son and still reads it now. Not sure how you ensure it's the UK edition -unless you log into a British site and get them to ship it over? Good luck, Clare. Thanks, Jane. All the best, Clare. I was blessed out of my socks. What a great phrase! So sorry for your loss and what a lovely tribute you've written. 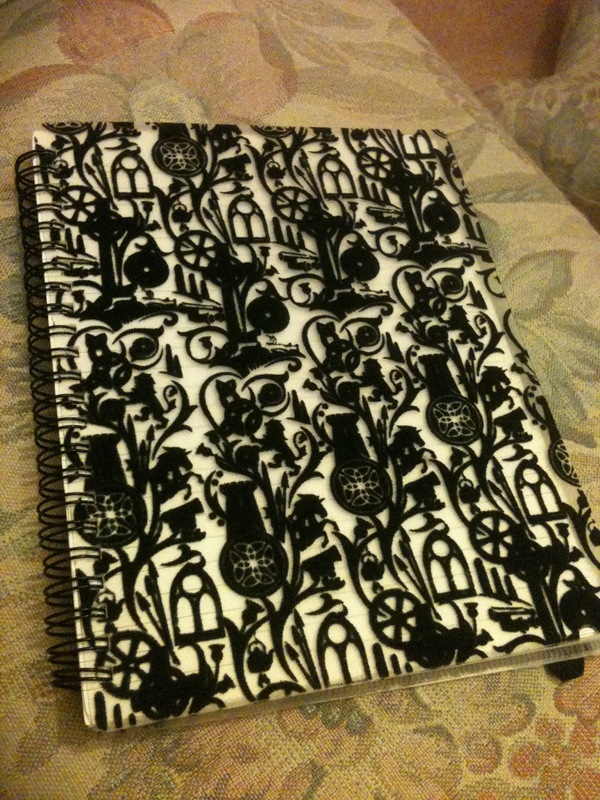 I love the fact that you are now using your Mums note book as your own. Thanks, Lynne. The black pattern on it is even furry! It's a bit like wearing her cardigans (which I'm doing right now). And Lynne, thanks so much for rotating the picture. I just couldn't get it to work -and my email's not working right now (I can read it but it won't let me reply) so I've just realised what you've done. Thanks, Clare. Your mum obviously gave you all a brilliant creative hinterland, Clare. What a fantastic legacy. Thank you for celebrating it here because it is inspiring and many parts of it resonated with me and made me nod knowingly - How important to be so encouraged. I would most definitely have loved meeting your mum! Poetry and creative joy were obviously such a vital strand of her DNA, and you have it, too. It will be there when you are ready, courtesy of your mum. Thanks, Moira. That's lovely. And yes, a lot of is is courtesy of my mum. Of my five siblings, three are musicians, two are painters (non-professional but very good), and several are linguists with a huge love of words. Inspired and loved. A nice combination. Made me cry, and realise what I've missed by not having a mother for most of my life. Take it gently. You will feel better eventually. Thank you Janet. And I'm sorry for your loss, too. Love Clare. Clare, reading this post makes me feel like I knew your mum. Am thinking of you. Keep talking to her! What a lovely tribute! I'm so sorry for your loss. Your mother's wisdom in exposing you to the sadder side of life really resonated with me. That's such a hard balance to find -- to let children know enough about sadness to begin the life-long process of understanding their own emotions, while still offering them the safety and love and hope they need. It sounds like she struck that balance with uncommon wisdom. Thank you, Jacob. It's a very tricky thing to balance. I'm so glad I've got my green children and that she gave me that but I still haven't shown the book to my children and I'm not sure that I would. It's a really hard call. I'm all for the stories that deal with death in a sensitive way (like No Matter What, and Old Pig, that my sister in law showed me for the first time yesterday). I was quite haunted by this but I'm so glad I had the dolls. I guess she wouldn't have given it to me without the dolls to reassure me. She was quite bonkers at times but she was a wise old bird. Thanks again, Clare. Thank you, Moonduster. All the best, Clare. I'm so sorry for your loss. What a lovely tribute to your mum. It seems so poignant that she sent you the manuscript. I bet she would love you to finish the book and get it published one day. Take care. Thank you, Catherine. We discussed her book lots and it wasn't completely finished but I know what was going to happen at the end. My brother writes, too, and he's really keen to finish it so we'll talk about the ending she discussed with me and he's going to do it. I've not looked at it yet (I was meant to be waiting to read it when it was finished, but I wanted a copy to keep secure, and my mum wanted my nine-year-old to look at it -she's a good critiquer) and it still feels a bit too raw to read but I will soon. Thanks, Clare. Very, very moved Clare by your words and also that photo that hug of unconditional love between you as a girl, and your mum and dad - what warmth in those faces! There's an energy in that love between you and between her and your children too. Having lost both my parents and taken some time to after that to get going again, I feel that slow-release kind of energy is what we are all really about. Perhaps it's simply about transmission to those around us and to those coming - through writing, painting, gardening, raising the next generation, or whatever and even through doing nothing at all, just being aware of that love or energy. It's good stuff and you're passing it on, just as your mum passed it to you. And thank you for sharing it! Thank you for your lovely message, Bridget. This is a beautiful post full of deep love. It made me cry but not all tears are an evil as Tolkien wisely said. Sorrow can be painful and healing at once - love like your wonderful mother's brings its own completion over time. She really will be always with you - like my beloved Nanna for me. Bless you Clare and thank you for sharing this. Thank you Philippa. So glad you had and have still got your beloved Nanna, as I will continue to have my mum with/in me. Hugs and more hugs and much love to you, dear Clare. Such a sad and beautiful piece ; I suspect I'm not alone in connecting with something very real and raw in myself when I read this. All us motherless children felt something tear anew as we read and empathised with your hurt. And in the middle of the tears, such images; your unpicking the pearl tears from the faces of the green children is straight out of Hans Christian Andersen. And to have had a mummy who sewed the original green children for her little girl ; and for that little girl to grow up and pass them on to her children. It shows that the story goes on. There is no ending, no line in the sand, no putting down of the pan or closing the notebook and saying -well ,that's that then. The End. Finis. Hard as it is, there are further instalments, more chapters, codas and epilogues, and in time, prefaces and new beginnings. Your mum has taught you all of that. She has shown you that stories are not always happy. Wisely, she showed you that some of the best stories are frequently sad, evocative and beautiful. That there are bittersweet page-turns and lurking thorns and leave-takings that last forever. But first and foremost, she gave you the best gift of all ; unconditional and absolute love. Love that transcends everything ; your mother has given you such an abundance of love to wrap around you like a warm shawl, to bury your face in when you need to shut out the day and to burrow into when you seek comfort. What a lovely woman she was and how much she loved you. And in the end, love is really all that matters, all there is of any importance in our lives. Thankyou for sharing your mum and her love with us. Thank you Debi for your beautiful message. 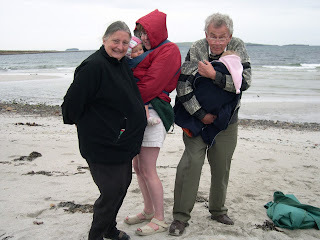 It doesn't take much to connect your message and the love in it to No Matter What (which my father read for the first time yesterday and loved -I've brought it up to Orkney with me). Your words, after she died, then through No Matter What, and here, have been an enormous comfort, since everything you do exudes love. I am currently wrapped up in one of her large cardigans but as you say, I'm wrapped in something much more important too. Her love. We are all very sad, but we are all very lucky. Thanks again, Debi, love Clare. Thank you, Paula. Writing the post has actually helped me, especially the lovely messages at the end. And whilst it feels very personal it also feels like part of something universal about love and our mothers, whether they're still alive or not. A beautiful piece of writing, Clare. I imagine your mother would be very proud of it and you. The photos are lovely - what memories to have. With all best wishes, Julie. What a wonderful mum! Lucky you, Clare. Does the Storr part of her name mean that she was related to the great Catherine Storr, by any chance? Thanks, Pippa. My mum was distantly related to Anthony Storr, the psychiatrist, who was married to Catherine Storr (her maiden name was something else). When they divorced, she kept the name, as far as I know. My mum never knew either of them but I did think it was pretty cool to have some kind of connection with Catherine Storr, however vague (I still LOVE Clever Polly and the Stupid Wolf). I have thought about you so often since your mum's death. Even though I've never met you in person, you're a special friend to me and my heart hurts for you. This post is so touching. I admire you for writing it when your grief is so fresh, and believe it will be a true treasure in years to come. It is so moving and I feel lucky to have this picture of the relationship you had with your mum...and that you have with your dad. I'm sure your love of writing and stories was a gift from your mum and dad...and what a gift. They touched you and you have touched so many with your special talent. Thank you, Penny. It seems strange to think we've never met when we're in such regular contact and read each other's work all the time. One day, we should try a skype-type meeting. I really appreciate all your support over the past eight weeks or so. What a beautiful and loving tribute to your mum. I am happy that her final days were doing the things she loved. She raised a wonderful daughter and I know that you will continue her legacy. That is a special gift she left behind for you. Her notebook and the unfinished stories is a continuation of the world she's created. Thanks for sharing a piece of your life and your mum's life with us. It is very touching. Thank you, Romelle. What a lovely comment, Clare. Clare, I am SO sorry about your mum - she sounds like an amazing woman! I feel as if I know her through this post! It's wonderful you have so many treasured memories of her! I hope your dad's doing ok - he's lucky to have you with him! Thank you, Lori. We've been lucky to be able to spend more time than we have done for years together. With five siblings and their busy lives and offspring etc., it's hard to spend as much time as you'd like to together but courtesy of my mother, since she died we've seen much more of each other and our nieces, nephews, and of course, dad. Long may that continue. A determination to see more of each other from now on has also been brought about by our mum. Love Clare. Thank you. Your mum would have been so pleased to know how we have all been moved and inspired by your beautiful recollections. I grieve with you. Thanks, Candy. As you know she was a huge admirer of you -and of Tall Story. And thanks for your all your lovely support. The children love you SO much! Thank you, Donna. That's very true. Clare this is a marvellous tribute, I'm amazed you've been able to open up and share this, it's a testament to the strength of your family. Your mum sounds like an absolutely wonderful person, it's deeply poignant how she helped to nurture your journey through books, stories and her own work. Don't worry too much about being able to write fiction at the moment - it will return, perhaps even stronger than ever, but these things take time. When I lost my mum and my wife in short succession it knocked all creative energies out of me for a very long time, but when I was eventually able to concentrate on books again I felt that they were standing right on my shoulders, urging me to pick up the pieces and create better art. They've never left me, and I know your mum is standing by your shoulder now. Whatever happens, happens, don't try to force things or worry about what you can't do right now, it's all a new chapter. Thank you, John. I love the idea of them standing right on your shoulders, urging you to create better art. And did you see Neil Gaiman's quote recently about when things are difficult... 'make good art'. I really appreciate your reply. Thanks again, Clare. A lovely and moving tribute to your mother, Clare, showing so clearly how much you appreciated her love, and her inspiration. Thank you for sharing this at such a difficult time. Clare, you write so movingly about Margaret. She was an immensely talented person and one who, like her father, wore her learning lightly. I think that is why she was so popular with children and her students. You never felt that you were being force-fed knowledge, just that you were in the presence of some one who knew something about everything and was a pleasure to listen to on anything. She would be so proud of you for such a lovely tribute. Oh Clare, Margaret sounds like an incredible mother and a huge influence. There's so much love, understanding and inspiration. I tell myself that the more you love, the more it hurts, but you wouldn't want to love any less. You certainly wouldn't Paeony. I know how very very lucky I was and still am. Thank you. Thank You Clare, for sharing your lovely Mum. This post so much resonated with me. A sudden and unexpected death is so tramatic and cruel - I lost my husband in this way five weeks ago, and I'm finding the grieving process so hard. There is no preparation, nothing leading up to ease you into acceptance. Thank you for sharing your wonderful mum with us. Dear Enid, I am so so sorry about the death of your husband. What a terrible shock and a terrible loss. Sending lots of love and strength your way. Thank you for your comment, especially in the light of all that has happened to you recently, love Clare. What a beautiful post. I am so, so sorry for your loss. What a beautiful life you shared with your mom. Thinking of you and your family. Thank you, Elizabeth. I am very very lucky in my family and have five wonderful siblings as well as a wonderful dad, not to mention all the in-laws, nieces, nephews, uncles, aunts, cousins -and my own children and husband, of course. Thanks again, Clare. So moved by your words. No writer can thrive without the inspiration of those who feed them. Your mum sounds like she fed you well. Am so sorry for your loss. She fed us well, Sita -In many ways (including the normal way -she was an excellent cook). We were very well nourished. Thank you, Clare. Such a lovely, moving tribute to your mum. She sounds like a wonderful lady. She was right to fear dementia, it diminishes people so. I lost both my parents to dementia while they were still alive. Thank you, Jonathan. I'm so sorry about your parents. It's a heartbreaking condition. You are right: we do have a great store of memories. All the best, Clare. This made me cry for the beauty in it. Thanks so much for sharing. I am so sorry for your loss. Thank you for your kind email. With very best wishes, Clare. She will be with you, and in you, in everything you do, Clare, as mine is in me. She will be with you in your stories, in your good times and your bad. She will be with you in in your children, beyond your life and hers. She will be with you because she IS you now, in some strange and magical way, and you are her. Thank you, Malachy. I really like that. You write so well and the love in your words is such a comfort. I knew your mum (not well) and absolutely loved they way you have added a little more 'knowing', thank you. Different siblings give different accounts. She was a wonderful mother! 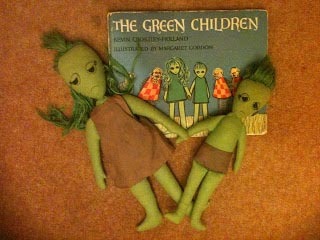 I was fascinated by your account of the Green Children (the dedication with which she made the dolls!) that sadness is often accompanied with beauty. Your parents did not make the mistake of protecting their children from sadness, as I did. For when then sadness comes, as it does, it can be so overwhelming that we drown in it and fail to see the beauty. I wish I had known your mum better. The Bells are an amazing family, as many before me have attested... so here is one more, just for the record. I shall find 'No Matter What' and read it. Stay well, no matter what, because we don't know what will happen... we just know that something will... With affection. PS Did you finish her book? Thank you for your lovely comment. I have been extremely lucky in my parents and my family. And what a hard job to get right about how much to protect your children from sadness... I hope you enjoy No Matter What. Make sure you get the UK version and not the US version (or the UK board book version, which is the normal US one) because they removed reference to death in the US one.